Actually, not the devil, but my husband. I used to be a diet soda drinker all my life. Truth be told, it was like a mortal sin to drink regular coke back in college. Far better to chase those calorie-ridden cheese fries with a Diet Coke. Sensible, right? Well, after I married darling hubby 12 years ago, I discovered that the man had never even tasted a diet soda. He was a regular Coca Cola man. Not Pepsi, thankyouverymuch. and so began my love affair with regular Coke…. S. wouldn’t even entertain diet soda, and in the first 5 years or so, I conceeded and starting stocking regular soda in the fridge. And, I started drinking it too. And by the year 2000 or so, I was hooked. 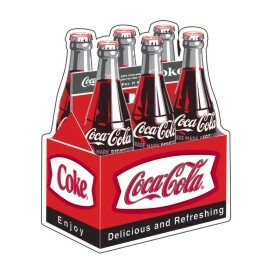 So, one of hubby’s resolutions this year (not nearly as interesting as mine, lol) is to drink less Coke. You see, the difference between S.’s cola drinking and mine is I have maybe one can a day. S. consumes about 5 cans, plus the 20oz.’er at work. Since marriage is all about “all for one and one for all”, and all that crap…. plus the fact that I am dieting (to wit I need him to support me there), I made a pact with the devil last night. Ok, no problem, right?? I mean, I don’t even drink a ton of the stuff… I drink mostly water anyway. Problem is, it’s 9:30am ET and all I am already thinking about not having a Coke with my lunch. Must be what smoker’s feel like when they go cold turkey. Thank goodness I have my Diet Coke.